What is MONyog - MySQL Monitor and Advisor? MONyog MySQL Monitor and Advisor is a "MySQL DBA in a box'' that helps MySQL DBAs manage more MySQL servers, tune their current MySQL servers and find and fix problems with their MySQL database applications before they can become serious problems or costly outages. MONyog pro-actively monitors enterprise database environments and provides expert advice on how even those new to MySQL can tighten security, optimize performance and reduce downtime of their MySQL powered systems. As a MONyog user you will know in advance if server resources will soon be running short. You can plan a hardware replacement or upgrade in comfortable time and not when it is almost too late (or just plain too late!). And the metrics about the server that MONyog gives you will help to decide what to upgrade: Faster CPU, More RAM, Faster disc systems - or maybe only remove another program from the computer where the MySQL server is running. Identify the SQL statements that run slow. MONyog provides a log analysis module, a 'query sniffer' and a 'processlist watcher' that makes it easy to identify the statements and applications that run slow on the server. This includes various filtering and EXPLAIN options for an efficient workflow when you want to optimize your applications. Monitor queries in real-time and snipe long running queries. MONyog provides a whole bunch of tools for finding problem SQL (Slow Query Log, SHOW PROCESSLIST snapshots, MySQL Proxy, etc). These tools are great if you want to find problem SQL in an application and tune those queries. However, using these tools to find problem is almost always a post-mortem exercise. In certain situations you may want real-time notifications for long running queries; MONyog gives you exactly that. MONyog can continuosly monitor queries in real-time and send notifications for queries that take more than a specified amount of time to execute. You can also specify an option to kill such queries. Get alerts for what you want and when you want. MONyog can send you alerts over mail or SNMP. Stay on top of significant events and avoid many sleepless nights! Monitor the MySQL Error log. 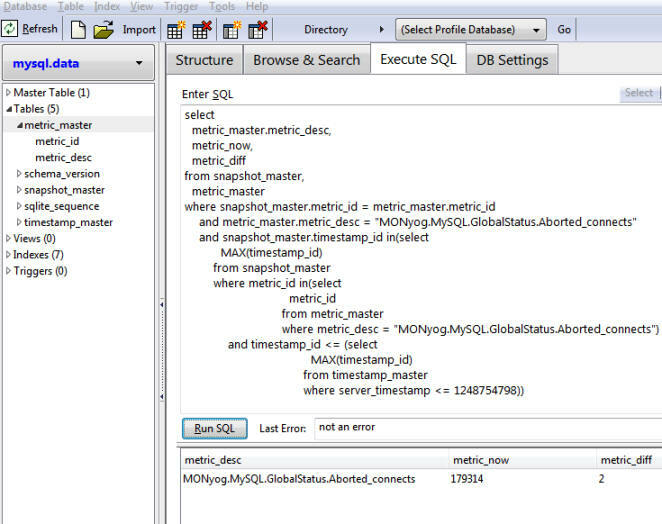 Monitoring the MySQL error log is absolutely critical for any MySQL DBA. Ignore the error log at your own peril! MONyog is the first MySQL Monitoring Tool to monitor the MySQL Error logs and can optionally notify you of changes to it. In the replication page a slave was not displaying indented compared to its master as it should if slave and master were running on same host. Fixed a multi-threading issue that in rare cases could crash MONyog if the Monitors page was viewed simultaneously in multiple browsers. Stability fixes for issues found during internal stress-testing and code review. No crash, slowdown (‘hang’) or similar was reported due to any of those, but it could theoretically happen under specific and rare circumstances.